A large, rambling homestead complete with coach house and stables built in 1850 has been converted into five charming self contained, self catering cottages. Bosky offers simple and comfy, peaceful and private, spotlessly clean accommodation. Bosky Dell (sheltered place) is perhaps the last secret hide-out of the Cape. In a truly unique setting directly above the iconic Boulders Beach, it seems lost in time.. 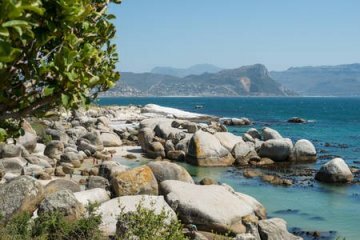 The spacious private grounds adjoin Boulders Beach, our garden gate leads directly on to the beach walkway. The white sandy cove below is strewn with giant granite boulders 540 million years old. It is sheltered from the wind and offers safe, shark-free bathing. Besides its incomparable beauty, the beach is famous for the unique colony of endangered African Penguins that took up home at The Boulders in 1982. You actually do swim with the penguins ! This is a nature lover's paradise - truly a hidden jewel where our visitors return to experience its magic. We invite you to take a step back in time, relax, unwind and rejuvenate here.